Political Notes By Emmanuel Aziken Only the ignoramus in today’s Nigeria will believe that the country’s most experienced presidential aspirant will abstain from the 2019 presidential election. After contesting in all presidential primaries/elections since 1993, the man who at the peak of his political power reportedly brought an incumbent president to his knees is again set for a make or break showdown with his political demons. 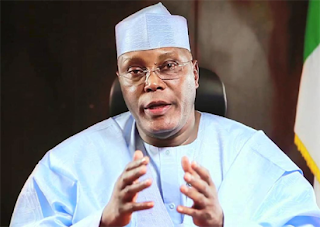 How Atiku Abubakar hopes to bind or the demons is an enchanting expectation many are hoping to see. No one has ever confirmed the following story. President Olusegun Obasanjo according to a tale, told some friends that when he dies and goes to heaven, as this correspondent prays, and hears that Atiku is bidding for the presidency of Nigeria that he would beg God to allow his return to Nigeria for an unfinished business! Obviously a fable, but it goes to buttress the enmity between the one-time presidential tag team. After losing the presidential ticket of the Social Democratic Party, SDP to Moshood Abiola in 1993, fate smiled on Atiku when Obasanjo picked him as his vice-presidential candidate in 1999. Only the heavens can now say whether that was a poisoned chalice. There is little doubt that while he poured his heart into governance, that he also used the time to prepare for the succession. His preparation for the office of President is better described by the quality of input he made into the success and stability of the Obasanjo administration; especially in its first four years. That success was, however, subdued by the subtle media campaign reportedly articulated by his associates styled as the Mandela Option. The campaign was aimed at luring Obasanjo to serve one term and exit the stage to become a global statesman just as Nelson Mandela had recently done in South Africa. Whether Obasanjo saw Atiku as a traitor or power greedy person may yet be an issue between the two of them. However, those who have come close to Atiku would know that there is hardly any Nigerian that has had better preparation for the office of President of the Federal Republic of Nigeria. Before the 2007 contest, he established an NGO, National Democratic Project, NDP with an office in the Asokoro area of Abuja. The office located opposite the home of Chief Tony Anenih was a research centre with specialists focused on virtually every aspect of governance. He also had at his beck and call, a number of consultants many of whom served and contributed positively to the success that many see of the Obasanjo administration. But for all his acclaimed political wizardry, it is quite easy to point at some obvious political gaffes in his political adventures. His abandonment of the Action Congress, after the 2007 election, and his rambling 2010 concession (or hate speech) at the PDP Convention were below the bar for a man who still looked to the future. Those attributes also showed his fallibility. He has nevertheless almost always been consistent in his message. His economic philosophy of free enterprise has been unwavering. In national cohesion, Atiku has also proved his credentials beyond reasonable doubt with a Yoruba woman, Titilayo as first wife and an Ibo woman, Jamilah Jenifer as the present poster lady. It is thus not difficult to believe his message of restructuring which in any case has been well articulated. Despite repeated dismissal of his aspiration by critics, the prospects for Atiku in 2019 cannot be under-estimated. Many will look beyond the Achilles’ heel of political inconsistency to the consistency of his message in a time when message and not body language will be the issue. It would, however, not be easy. It is bound to be interesting for many journalists waiting with bated breath at the likely inclinations of Mallam Garba Shehu, the likable former media strategist of Atiku now seating near the camp of those plotting to eviscerate Nigeria’s most experienced presidential aspirant.